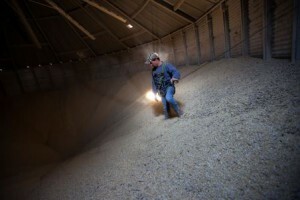 The National Corn Growers Association and the National Grain and Feed Foundation – the research and education arm of the National Grain and Feed Association – recently unveiled a joint video project to promote awareness about grain bin safety on the farm. The two organizations teamed up in November 2010 to develop the video in response to an increase in U.S. fatalities and injuries associated with entry into grain bins. It’s pretty powerful. The video, shot on location in several states, provides a wide range of information on prevention tips and background data on grain bin accidents. The project also involved interviews with professionals in the fields of grain bin safety research and rescue. The producers are hoping to get this in the hands of as many farmers as possible and are making DVD copies of the grain bin safety video available for ordering. As we noted in a blog earlier this year, the number of fatalities in grain bins reached record levels in 2010. There were 51 grain bin accidents last year, up from 38 in 2009 and the most since tracking began in 1978. Twenty-five people died, and five of them were children under age 16. The previous record for grain bin accidents was 42 in 1993. In response, OSHA has developed an explicit program to improve safety in grain bins. In doing so, they have increased the pressure on bin operators to operate safely. The stakes have been raised beyond even the robust fines that OSHA routinely hands out for violations. As an example of the new program in action, OSHA has cited Lakeland Feed and Supply in Hamilton, Montana, for exposing workers to grain bin machine guarding and fall hazards, along with other safety and health hazards. At this point the fines total $122,500, but this might change after corrective actions and negotiations. …Platforms missing guarding; no landing platform on a ladder; unguarded shafts, pulleys, chains and sprockets; the lack of an emergency evacuation plan and no fire alarm system; employees walking on grain in the bins; high levels of potentially explosive dust; the lack of a housekeeping program; not locking out augers when employees enter the bins; exposed live electrical lines; improper electrical wiring for high dust areas; and employees not trained on the hazards and chemicals associated with their work. Turn off and lock out all powered equipment associated with the bin, including augers used to help move the grain, so that the grain is not being emptied or moving out or into the bin. Standing on moving grain is deadly; the grain can act like ‘quicksand’ and bury a worker in seconds. Moving grain out of a bin while a worker is in the bin creates a suction that can pull the workers into the grain in seconds. Why does this matter? Attorneys for workers injured in storage bins will review the details of any and all accidents. Where the above standards have not been met – and they are not easy to meet! – these attorneys may aggressively pursue increased sanctions against employers. In many states, injuries due to the “wilful intent” of the employer result in higher indemnity payments. In the event of serious injuries or fatalities, attorneys may attempt to pierce the “exclusive remedy” shield of workers comp and secure substantially higher benefits due to employer “negligence”. In other words, OSHA may have raised the stakes for grain bin operators above the traditional “no fault” level. While there is nothing radically new in the required safety procedures, the fact that OSHA has presented a definitive list means that employers are accountable for each and every one of these procedures. As is customary, violations will result in heavy fines. But in addition to the fines, bin operators may be at risk for exposures well beyond the “usual and customary” comp benefits. The working conditions in grain bins are extremely challenging. There are critical time pressures, complex mechanical issues, weather concerns and at times, a shortage of trained labor. Teenagers -all too frequently the victims in bin accidents – may or may not take safety precautions seriously. If life on the farm is difficult, life in the bins may be even harder. When it comes to safety and the protection of the people doing the work, OSHA’s sympathies are with the workers. 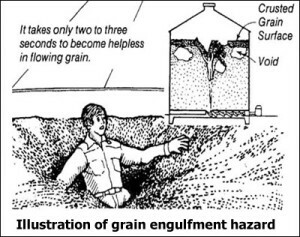 In this environment, when serious accidents occur, employers will be judged by a single criteria: did they follow the OSHA book on grain bin safety? If not, bin operators are likely to pay, pay and pay again.